GCK _ Jiangsu Zheng Wei Electric Power Equipment Co., Ltd.
Houndreds types product as like GCK low-voltage withdrawable switchgear is widely used in power plants, substations, industrial enterprises and the high-rise building power distribution center PC and MCC, motor control center as ac 50 to 60 hz, the rated working voltage of 660 v and below, rated current is 4000 a and below the hair, power supply system in power distribution, centralized control of the motor, reactive power compensation using low-voltage power distribution equipment. In a three-phase three-wire or three-phase four-wire system, it is used as a special purpose for transformer, feeder or motor of a low-voltage distribution system. Houndreds types product as like GCK low-voltage withdrawable switchgear in the electrical performance is higher than similar products on the basis of increasing the capacity and mechanical strength, and has the advanced structure, good appearance, high protection grade, safe and reliable, maintenance is convenient wait for a characteristic; It can be used as a replacement of low-voltage switchgear. 1. The cabinet frame is made of shaped steel, and the three-dimensional corner plate is used for positioning. Bolts are connected to non-welded structures to avoid welding deformation and stress and improve installation accuracy. 3. The internal structure is galvanized, and the exterior is pickling and phosphating. Electrostatic epoxy powder is used for spraying. 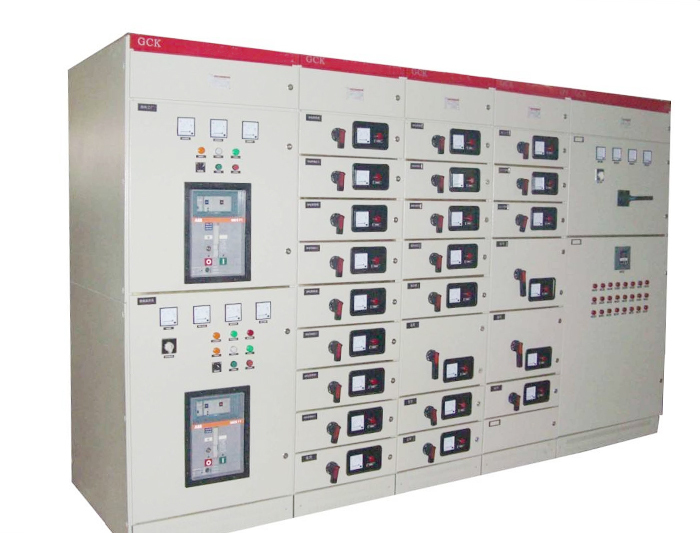 4, incase, the power center (PC) into the line at the top of the bus for level regions, lower level of busbar area for circuit breaker, the breaker can be configured homebred DW15C, MB series, can also according to customer's need to configure the foreign electric company production of various kinds of circuit breaker, such as: ABB F series circuit breakers, and intelligent circuit breaker. In general, the PC unit is equipped with a main circuit (including the bus) that is inverted, and when the rated current is between 630A and 1600A, it occupies a cabinet body with an external dimension of 800*1000*2200 (width * depth * height). The main circuit without rearrangement occupies a cabinet with an external dimension of 800*800*2000 (width * depth * height). When the rated current is between 1600A and 3150A, it occupies a cabinet with an external dimension of 1000*800*2200 (width * depth * height). The structure of the power center (PC) feeder cabinet is similar to that of the wire inlet cabinet. When the feed current is between 630A and 1600A, a cabinet body of 1000*2200 (wide * deep * high) can be installed with two circuits, which can be arranged and installed for up and down. 5, motor control center (MCC) switchgear have installed against the wall and without wall two kinds, the top is horizontal bus bar area, level areas for drawer below functional unit area, the area of the width is 600 mm, install the drawer function unit area is 1840 mm high, when the cabinet put oneself in another's position is against the wall to install ark of left as functional unit area, the right cable has a 200 mm wide area, cabinet put oneself in another's position appearance size is 800 * 500 * 500 (width * * deep high), when the cabinet put oneself in another's position is installed from the wall, cabinet put oneself in another's depth is 600 mm, Cable area appeared in the appearance of cabinet put oneself in another's position size is 600 * 800 * 2000 (1000) (width * * deep high), 800 and 1000 two cabinet put oneself in another's depth, we recommend the user to select 1000 deep cabinet put oneself in another's position, in depth with PC is unified, when outside drawer ark, incase charged parts not exposed, safe and reliable. 6, drawer function unit and door mechanical interlocking, conducted by the operation of the main switch, the main switch closing position door won't open, and operators can be used outside the padlock lock in closing or break-brake position. Functional unit compartments are separated by metal looseness, drawers have good interchangeability, and there are working position, test position and separation position. When the drawer to a location, drawer automatic positioning, at this time but after drawer on the left side of the plate drawer can remove positioning, into the next position, drawer ark also have anti-separtion function when outside. 7, the capacitance compensation, measurement and other stationary solutions of cabinet put oneself in another's position and drawer cabinet put oneself in another's position have the same shape, same level bus position, thus ensuring the cabinet put oneself in another's position of withdrawable type and fixed type can be used side by side. 8, busbar system: cabinet put oneself in another's position of busbar three-phase five wire system, the level of bus rated current under 1250 a and the level of single bus, bus rated current for more than 1250 a tank with double busbar with tank level between bus USES the connection piece of lap, vertical bus adopts galvanized sheet enclosed, internal use clapboard limiting diffusion arc, neutral bus set in the front of the ark, protect bus (PB) set in the bottom of the tank, and is linked with baffle plate, door of cabinet put oneself in another's position, to ensure that the grounding continuity. 9. Natural ventilation Windows are provided at the bottom and top of the switch cabinet without reducing the protective level of the shell. 10. The protection level of cabinet shell is IP40.